"Don't worry, Big Momma will be here." MPAA Rating: PG-13 for crude humor including sexual innuendo, and for language and some violence. While I was watching Big Momma's House I started to get the impression that I was about ten years too old to enjoy the movie. Aimed at a younger audience who find rampant use of bathroom humor a necessity, Big Momma's House will fit the bill for most 13-year-olds. Grossing nearly $120 million earlier this year, this film was a runaway hit, and I am still trying to figure out why. Malcolm Turner (Lawrence) is an FBI agent with a specialty for elaborate makeup. Malcolm goes with his partner John (Giamatti) to Cartersville, Georgia, and set up outside Hallie Mae Pierce's (Mitchell) house. A killer and bank robber (Howard) has escaped from prison and has intentions of finding his ex-girlfriend, Sherry (Long), who is happens to be Pierce's granddaughter. However, when Pierce, a.k.a. Big Momma, goes away on a trip and Sherry calls to say she's coming, Malcolm must pretend to be Big Momma. 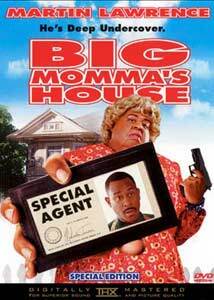 From the best I can tell, Big Momma's House is supposed to have been a comedy. If that is true I am amazed by the fact that I only laughed a handful of times during the overly long running time of 90 minutes. In fact, I spent more time counting the numerous plot contrivances set up by screenwriters Darryl Quarles and Don Rhymer. For instance, it is understandable for a long-lost granddaughter to not realize that Big Momma looks nothing like she usually does, but it is another thing for the neighbors to think it is the same person. Big Momma's House also makes the mistake of pointing out plot points before they even happen. When Sherry forgets a bottle of pills while packing, is it any surprise that they will turn up later? The whole movie seems to rely on coincidence. This is not to say that Lawrence doesn't do a worthy job pulling double duty. It is just too bad that while the majority of his screen time is as Big Momma, he does much better, with less screen time, as Malcolm. Nia Long's Sherry is so one-dimensional that it is a wonder why she and Malcolm hit it off. Terrence Howard seems to sleepwalk through the film with hardly any use, or dialogue for that matter. In fact the consistently good Paul Giamatti gives the only worthwhile supporting performance. Image Transfer Review: Presented in a THX certified 1.85:1 anamorphic transfer, Big Momma's House looks great. Sharpness and detail are both very good, but some of the darker moments are a bit hard to see and seem slightly grainy. Colors are good, and there are never any flaws. There are some small flaws with the print used; but aside from one small moment of pixelation, there aren't any real problems with this transfer. Audio Transfer Review: The Dolby Digital 5.1 mix is adequate for this type of film, with the surrounds coming alive for a few moments during a thunderstorm as well as with the constant use of rap music in the film. Dialogue is clear for the most part, and there is nice use made of the .1 LFE channel. The left and right speakers are even and help provide a nice front sound stage. English and French Dolby surround tracks are also made available. Building Big Momma's House is more or less a promotional featurette, but it is worth a look. Showcasing interviews with the cast and crew, as well as the make-up artists who had their work cut out for them, this short runs about ten minutes. The disc shows both an unused opening sequence as well as a deleted scene with commentary by Gosnell. The outtake section, while a bit repetitive, provides a few moments of laughter, as do the make up tests included. Since I would rather go through brain surgery without anesthesia than watch a rap music video, you will have to see for yourself whether Li'l Bow Wow's Bounce With Me or Jermaine Dupri's I've Got To Have It are worth a look. The theatrical trailer for the film as well as three TV spots and a trailer for Me, Myself, and Irene are also offered up. As you might be able to tell, I hated this film. The only saving grace is that it is a nice DVD from the folks at Fox. I am still trying to figure out why films like Great Expectations or The Thin Red Lineget no extras, yet this film is filled to the edges. Such is life, I suppose.